We’ve arranged this numerical journey of various insightful digital marketing statistics to build up from those with the smallest percentage to the highest, and we hope you’ll gain a generous helping of new ideas through this lighthearted statistical look at where marketing is, and where it’s heading. Why should digital marketers care about these statistics? We’ve combed through a vast number of reports, studies, surveys, polls, and other types of data, and these are 50 of the most inspiring statistics that are both from high-caliber sources — including the Pew Research Center, Nielsen, NPR, Edison Research and Umass Dartmouth — and which give insight into where digital marketing is today and where it’s heading in the future. We’ve also explored the value of influencer marketing in the B2B world in recent pieces such as “Why Always-On Is Always Better for Driving B2B Influencer Marketing Success,” “5 Examples of B2B Influencer Marketing to Inspire You in 2019,” and “The Next Level of Influence: 30 Essential Influencer Marketing Statistics,” each a helpful look at how you can join the four percent if you’re not already a member of this elite but growing segment. 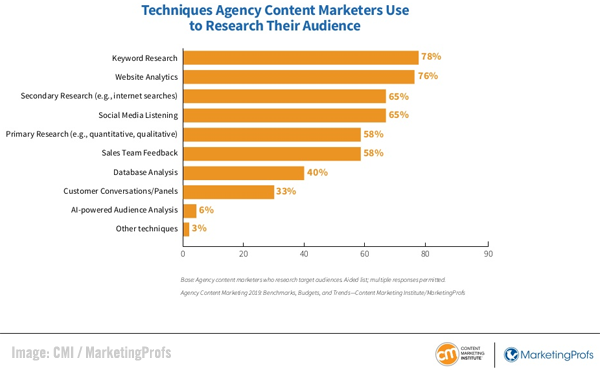 5% of B2B content marketers use predictive technology to nurture their audience. 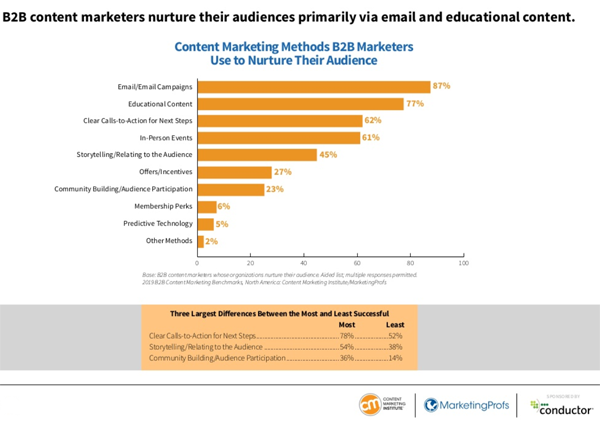 At the other end of the scale, the following chart from the report shows that email and educational content are the most-used methods content marketers use to nurture audiences. 8% of the U.S. digital advertising market will belong to Amazon by the end of 2019. 10% of consumers make purchases using smart speakers or home assistants. With their rising implementation, we even placed chatbots in the number three spot on our list of “6 Top Digital Marketing Trends for 2019,” along with other artificial intelligence and machine learning technologies. 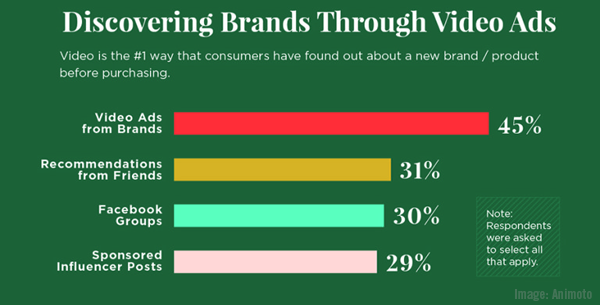 Such recommendations from friends were also shown to be the second most effective way that consumers find out about a new brand or product before buying, as shown in the following Animoto chart. This statistic helps make clear that if your brand is looking to reach new audiences, there’s never been a better time to add podcast creation to your content marketing toolkit. 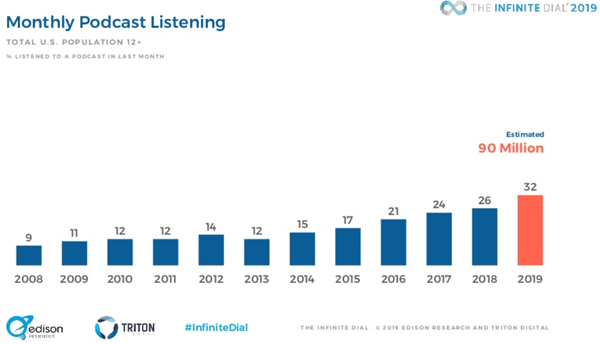 The New York Times has just published a piece looking an new survey results showing the biggest increase in podcast listeners yet, with one in three in the U.S. tuning in to at least one podcast every month, as shown below. 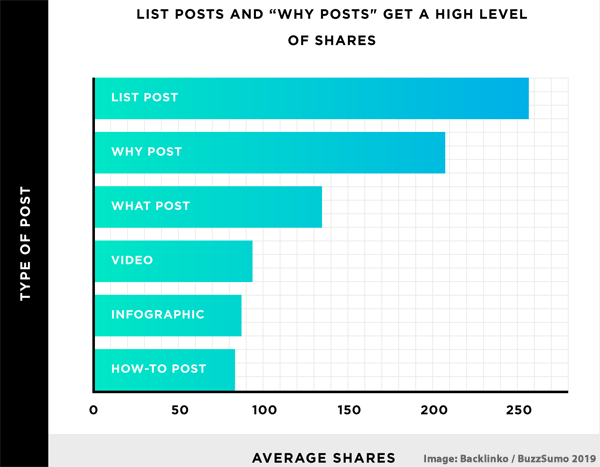 Knowing how to best make use of those words that will be read is key to content marketing success, and BuzzSumo and Backlinko recently studied the performance of key elements in blog posts, pulling statistics from 912 million posts, as shown below. Audience research trends were recently the subject of a survey from the Content Marketing Institute and MarketingProfs, with some of the results shown below. The use of the popular “stories” format has grown on Instagram, and stories have made their way to most other major social media platforms. With this move comes an increased need for guidance in making most of the format, especially among B2B marketers. 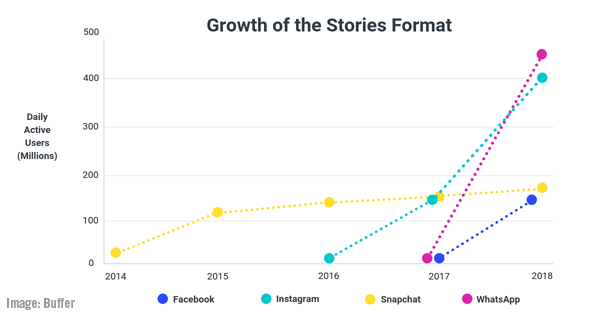 How 200 leading global brands are utilizing the stories format was the subject of a Buffer study, with the format’s growth on various social media platforms shown in the following chart. Live video has now also made its way to LinkedIn (client), with the launch of LinkedIn Live to build on the success of its standard video offerings, which were already the fastest-growing format on the platform. 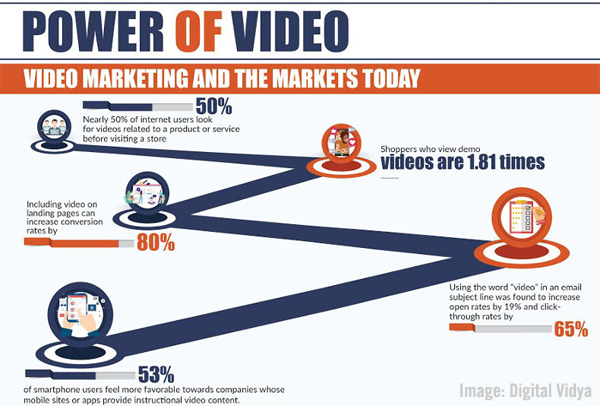 Video has the power to deliver compelling messages, as shown in the following image from Digital Vidya. This statistic points out the importance of knowing where your particular audience is most likely to spend time, so that you have the best chance of reaching them. It’s worth comparing the social media channels your business uses to make sure they align with where your audience will be. Buffer recently released its 2019 State of Social report, offering an in-depth look at what digital marketers are focusing on and an examination of trends and how the industry is changing, with data such as the chart below. Artificial-intelligence-powered chatbots have seen a rise is use, with 85% of customer service interactions expected to use the technology by 2020 (Gartner). 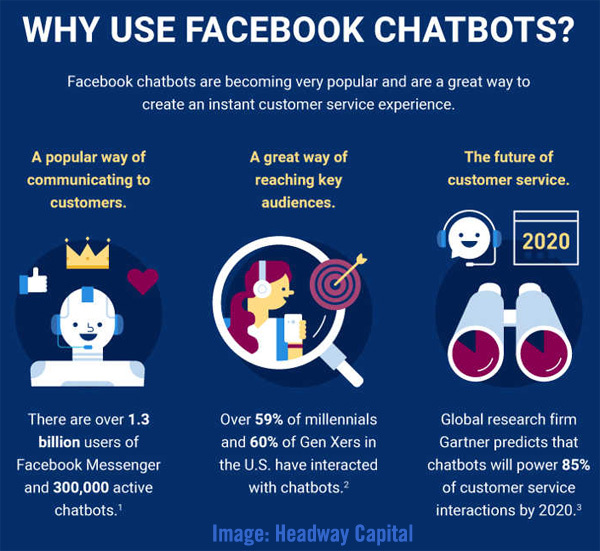 MarketingProfs and Headway Capital took a look at implementing chatbots for Facebook Messenger, as partially shown below. Even among firms on the Inc. 500, social media has remained a major factor over the past several years. A recent study by the Center for Marketing Research at the University of Massachusetts Dartmouth took a close look at how these top firms utilize social media, as shown below. 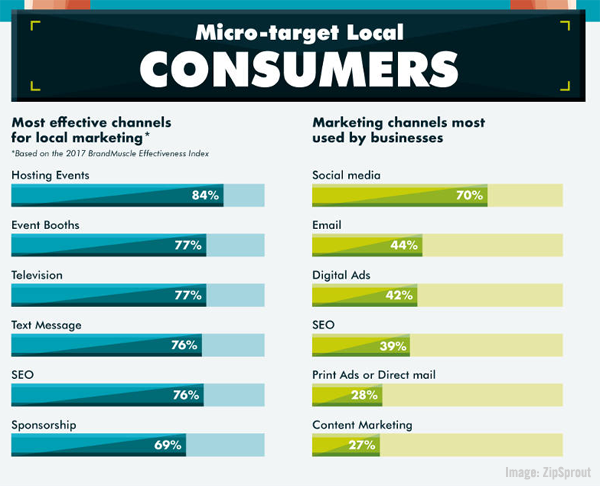 Study data of smaller firms has also shown the importance of social media marketing, such as the infographic from ZipSprout that MarketingProfs examined recently, as partially shown below. 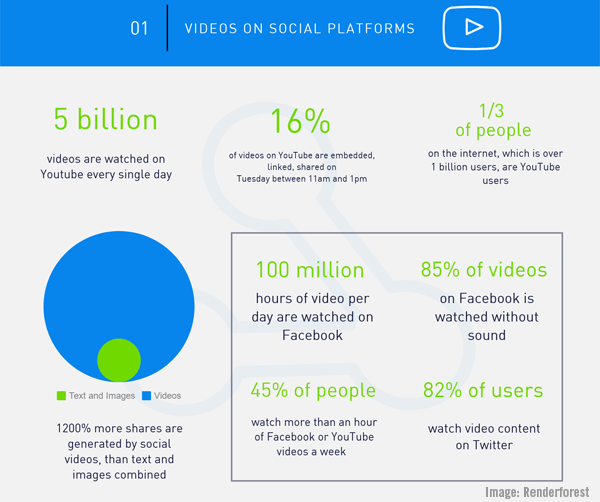 The prominence of both standard and live video has continued to expand, with some five billion videos viewed daily on YouTube alone, and a recent report and infographic from Renderforest digs into some of the numbers behind the growth, as shown below. Now here’s a statistic that hits home for us, as we have recently been working hard to extoll the merits of bringing the creativity and energy often associated with B2C into the world of B2B. In fact, we dedicated an entire guide to just this subject, with our “Break Free of Boring B2B Guide,” featuring more than a dozen top B2B Marketing Exchange speakers from firms including Google, 3M, Demandbase, Fuze, and others. 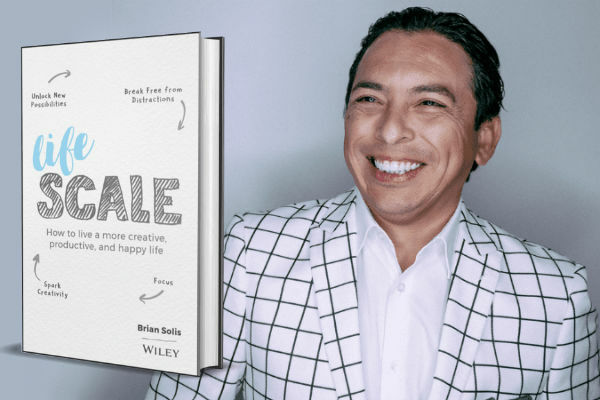 Check out the guide below, or click here to view the full-screen Break Free from Boring B2B experience. I encourage you to use these digital marketing statistics to create meaningful experiences that inspire, and to help guide and shape your campaigns, as industry knowledge backed by quality research can infuse your work in any area of marketing with both new energy and possibilities. You can also keep up with new statistics and research by following the TopRank Marketing blog, which recently celebrated its 15th year of covering digital marketing, or come see us in person at an upcoming conference. Our CEO Leo Odden will be presenting this week at inOrbit 2019 on March 14 – 15 in Slovenia, followed by Clever Content Conference 2019 on April 9 – 10 in Denmark, and at Content Marketing Conference in Boston on April 16 – 19, each a great opportunity to learn how to best put those statistics to use. The post Around the World in 50 Captivating Digital Marketing Statistics appeared first on Online Marketing Blog – TopRank®.